Creating CSS animations may be about learning the syntax, but mastering a beautiful and intuitive-feeling animation requires a bit more nuance. Since animations command so much attention, it's important to refine our code to get the timing right and debug things when they go wrong. After tackling this problem myself, I thought I'd collect some of the tools that exist to aid in this process. Say you have multiple animations running at the same time and you'd like them to stagger just a bit. You can use animation-delay, but don't necessarily want the viewer to visit the page and have some things not moving, waiting for their delay. You can set animation-delay to a negative number, and it will push the playhead back in time, so that all animations are running when the viewer shows up. This is particularly useful when the animations share the same keyframe values and are differentiated in movement only by the delay. You can use this concept for debugging. Set animation-play-state: paused; and then adjust the delay to different negative times. You'll see the animation in different paused states along the tween. See the Pen LVMMGZ by CSS-Tricks (@css-tricks) on CodePen. In a fun demo, we see the two robotters hovering at a very slightly different time in order to feel a little more natural. We give the purple robotter a negative delay when we declare the hovering animation so that he's moving when the viewer first sees the page. See the Pen Robotter Love by Sarah Drasner (@sdras) on CodePen. For best possible performance, you should also be moving and changing things with transform, and save yourself from the cost of repaints with margin, or top/left and the like. Paul Lewis has a great resource called CSS Triggers that break down these costs in an easy-to-see table. The gotcha here is that if you try to move things with multiple transforms, there are a number of problems. One big problem is ordering. Transforms will not be applied simultaneously as one might expect, but rather, in an order of operation. The first operation done is the one furthest on the right, then inwards. For example, in the code below, the scale will be applied first, then the translate, then the rotate. This will lead to somewhat surprising, and less than ideal results. The answer, unfortunately, is often to use multiple nested <div>s, applying a single translation to each, so that no conflicts arise. See the Pen Show Order of Operations Transform Fail by Sarah Drasner (@sdras) on CodePen. The multiple div implementation can also help with troubling bugs with SVG. In Safari, you can't declare opacity and transform in animation at the same time — one will fail. You can see the workaround in action in the first demo in this article. In early August 2015, independent transform declarations have moved into Chrome Canary. This means we won't have to worry about ordering much longer. You'll be able to declare rotate, translate, and scale separately. 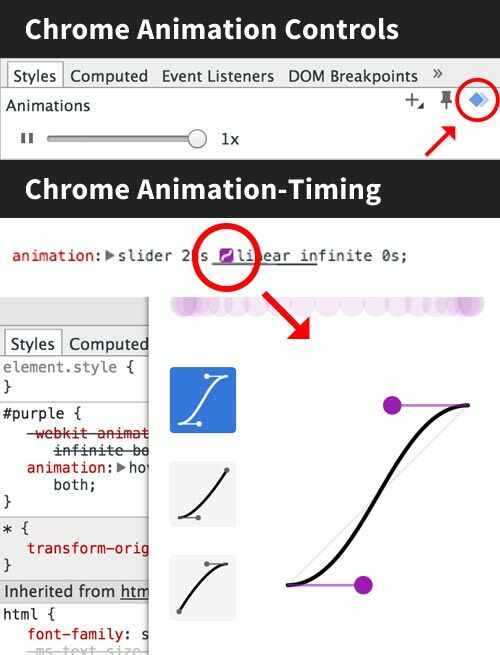 Both Chrome and Firefox now ship with some tools specificially for helping work with animations. They offer a slider for controlling the speed, a pause button, and UI for working with the easing values. Slowing things way down, and seeing the animation at particular stopped points is pretty darn helpful for debugging CSS animations. They both use Lea Verou's cubic-bezier.com visualization and GUI. This is extraordinarily helpful, as you no longer have to do the back-and-forth from cubic-bezier.com to text editor to proofing. 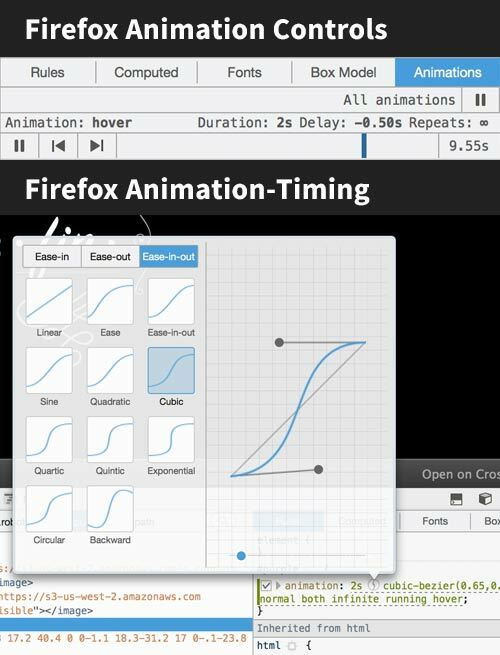 Both Chrome and Firefox allows you to control the timing (speed up or slow down), and also manually scrub through the animation. More advanced timeline tools are coming in Chrome that can look at multiple elements at at time. That will be nice, as working with only a single element at a time in an animation is fairly big limiting factor. One thing I have some trouble with is grabbing the element quickly enough if the animation is short-lived and fast. In those cases, I'll usually set it to animation-iteration-count: infinite; so that I can continue to play with it without having to fight time. I also find it extremely helpful to slow the animation way down and then replay and adjust the timing in the browser with these tools. It allows you to pull apart each movement at a fundamental level and see how everything is interacting and what the motion progress looks like. If you refine it at that speed, when you adjust it to play faster, it will look much more masterful. I often see people declare the same property and value at the 0% keyframe and 100% keyframe. This is unnecessary and leads to bloated code. The browser will take the properties value as the initial and ending value by default. Be careful. Offloading too many elements at once can cause an inverse effect and performance to tank. Most animations should be fine, but be aware of this if you're using something like haml to generate tons of DOM elements. Imagine that you're moving 30 objects at the same time; you are asking a lot of the browser, and it makes sense that this would create problems. If you have a speed of 0.199 seconds and a delay of 0.2 seconds on each object, you would fix the problem by moving only one object at a time. The fact that the same amount of total movement happens doesn't matter: If the animation is done as a chain, performance is immediately improved by 30 times. See the Pen SASS for loops in CSS Animations by Sarah Drasner (@sdras) on CodePen. But let's say you're making refinements, and you discover that the second count of the first animation should change. This affects the delays of everything following it, so let's adjust our timing for each one after. No big deal. But now let's add another animation and adjust the timing of the second one again (this kind of fine-tuning happens all the time when creating a really nice animation in production). Well, this is starting to become a little inefficient. If you do that 3 more times, it's really inefficient. Making an animation work well is so much more than just building it. Typically, it's the editing, refining, and debugging that take a project from merely moving to a well-orchestrated and performant piece. Hopefully these tips put a few more tools in your toolbox and smooth some rough edges in your workflow. Awesome article. A lot of really helpful tips and tricks in there. I wonder if there are any tools out there for authoring CSS animations in a timeline-like manner? Something similar to tweens back in the Flash days, except, it spits out CSS animations? Hey look at that! Cooool. Nice tip. Thank for the article, very clear and easy to read! Amazing information in you article. New trics learn from you. With css we can generate easily grapics and animation. Dev tools and loops are better for this. Good job. Thanks for share it. Relative to getting the help of the GPU, isn’t it total overkill to use will-change, backface-visibility and transform properties at the same time? Good question! I typically don’t use will-change that much myself, just the other three, but I know others that swear by it. It would be worth a quick test to see if there are advantages to adding will-change in as well (I’ve run tests that show there are huge advantages to the other three- see https://css-tricks.com/weighing-svg-animation-techniques-benchmarks/) but should try again both with and without will-change, on divs. I would say test anything perf-related, personally. Regarding the multiple transform issue, it’s easily remedied by adding “none” to the keyframes with fewer transform values. But if I’m wrong about that, please let me know, I’m always trying to learn. In fact, the transforms always are animated ‘simultaneously’ because there are no different transforms, but just one transform (just as the CSS syntax, where all transform functions make up just one value of the single transform property) with several components, animating through several intermediate values. The problem is, that missing values for the transform components mean their default values, not “unchanged”. I.e. So, in my opinion, saying that “transforms are applied one after another” is kind of oversimplification. Hi SelenIT! Your pen is great, I think it’s the first one I’ve gotten that does demonstrate how to use one div for all the transform values, I’ll edit the post to include this solution. Fantastic. One thing I will say is that writing this isn’t that intuitive- consider that you need to adjust just the scale from 1.5 to 1.75 at 60% instead of 65%. You then have to go recalculate all of the other values that normally would be interpolated for you. I’d say that that kind of workflow jam can really slow you down when animations get more complex or you’re trying to refine a few things at once. Still, you avoid multiple divs, so it really depends on what you’re optimizing for. Again, thanks for the input, I’m sure it will help people.